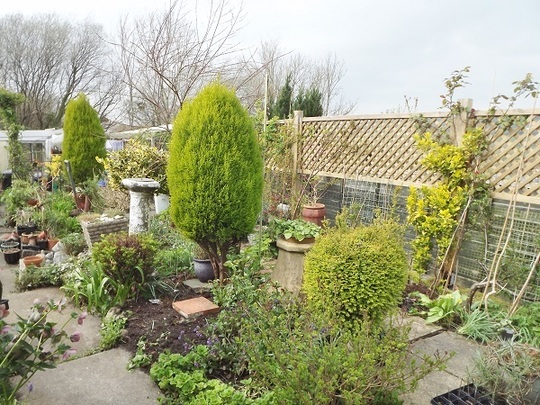 We had some beautiful weather here last month, and I took advantage of it by doing a bit of gardening when I got the chance. Clematises and Roses growing on the trellises I had put up last year needed tidying, and there were also other shrubs in the garden that needed cutting back. 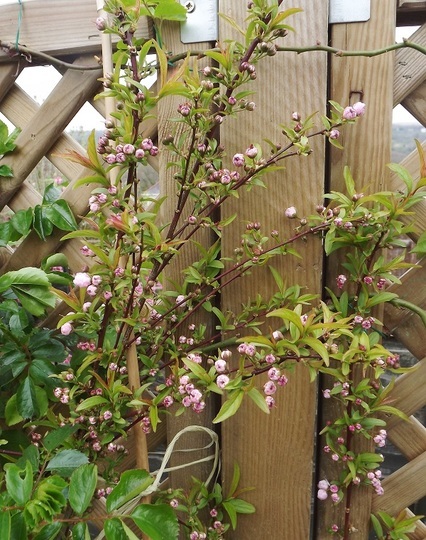 Prunus triloba is coming into flower and using the trellis as support. 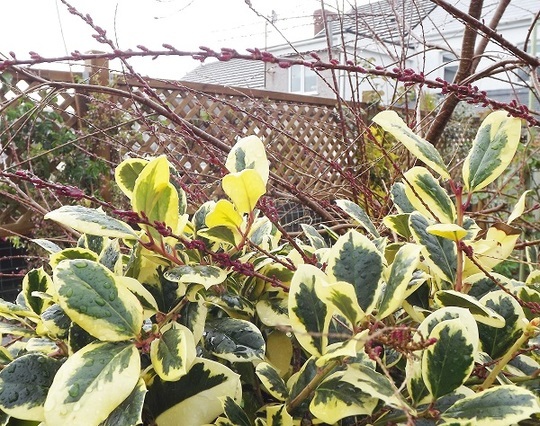 My lollipop Ilex Golden King and my Tamarisk are fighting each other for room and their branches are becoming tangled up one with the other, so they will have to be separated. The Ilex is the smaller of the two and will probably be easier to dig up, so I think that’s the one to be moved. I was going to do it last winter but other things happened, so it will now have to be done in the autumn. During my short stints in the garden I saw a peacock butterfly, several bumble bees and hover flies, and a lady bird. I’m trying to get my little vegetable patch cleared so that I can sow some seeds soon, but I’ll tell you more about that later on. I hope everyone is all right. Previous post: Mid February already. How the time flies ! Looking lovely. Is the mesh over the plants to stop your helper taking a snooze, or worse, there? Thanks Grandad gardener, it's a wire shelf from one of those plastic plant growing houses, and it's in my front garden. I put it there to stop a certain stray cat from scratching the soil and using it as a toilet. lovely Hywel. 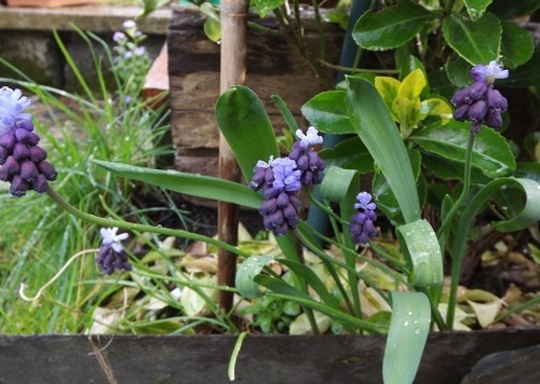 that little blue bulb is probably puschkinia libanotica. 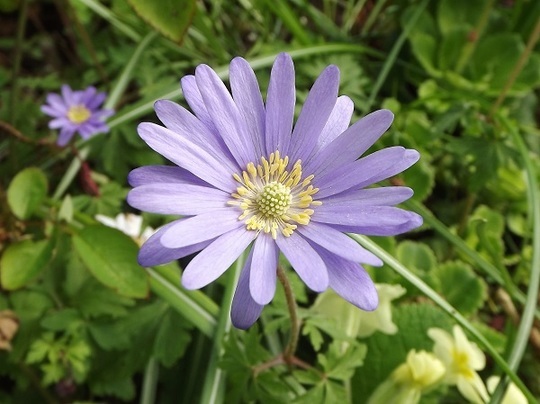 Pale blue with a slightly darker blue stripe on the petals. 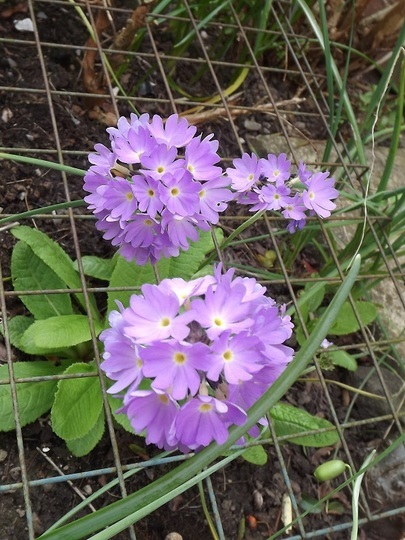 I love it as it flowers towards the end of the bulb season. hubby and I were in Wales last week visiting daughter and the weather was glorious. managed to get to a few nature reserves too. saw the same flutterbies that you have and the blue bells were just starting to colour up. 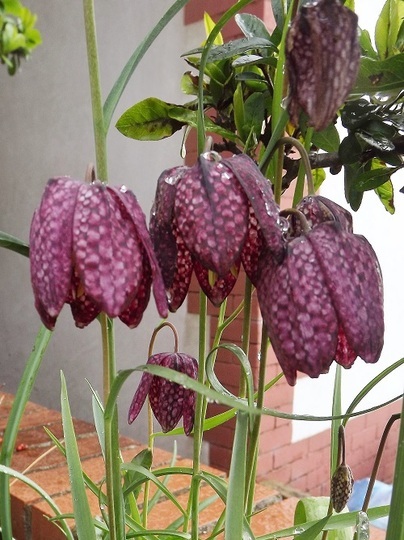 love the snakesheads they are such a delicate looking thing but so robust. 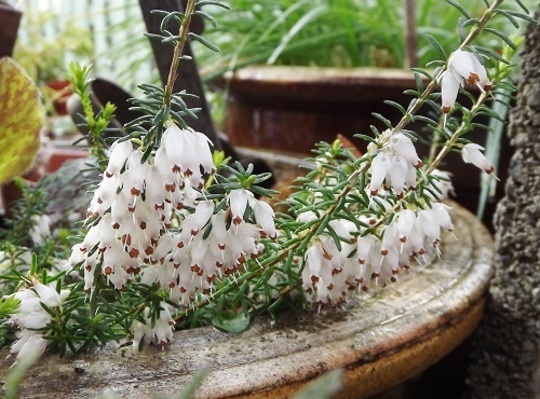 I look forward to seeing the tamarisk in flower. Bella looks content. hope you are both well too. Thank you Seaburngirl. Thanks for the name of those little bulbs, yes they have a stripe down the middle of the petals. I'll show the Tamarisk when it flowers. Sadly Beryl's been through a rough patch lately and that's why I haven't been on for a while - couldn't concentrate on forums. But she's all right again now. 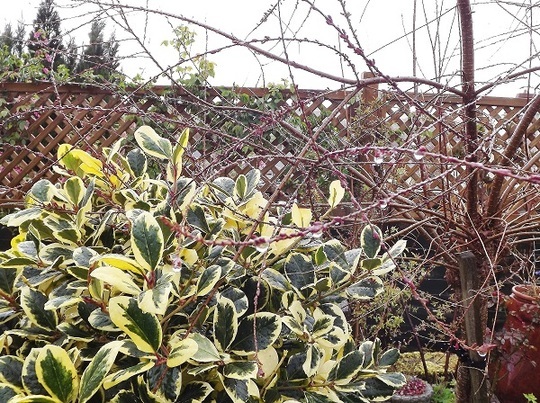 It's all looking splendid, even if the Ilex and Tamarisk are getting a bit too friendly and misbehaving. 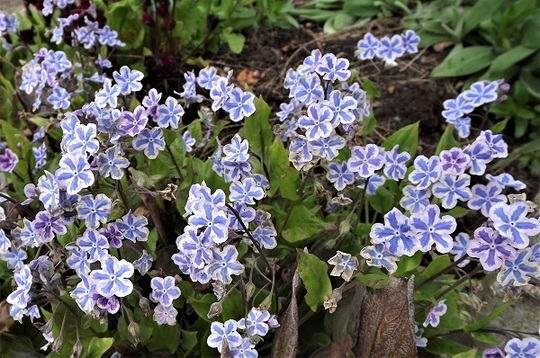 The Omphalodes is lovely, must get some of those. 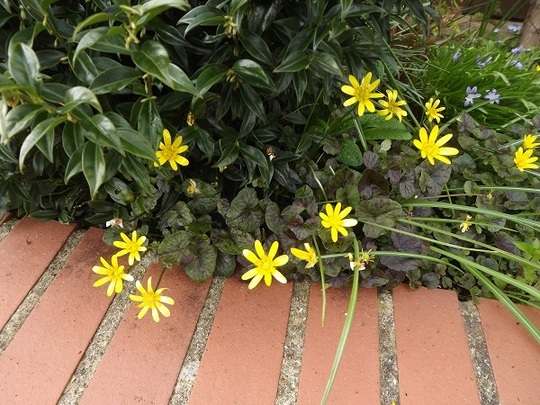 I have a soft spot for Celandines, I know a lot of people have trouble with them, I suppose my love of them is a childhood thing, but the few I have behave here. 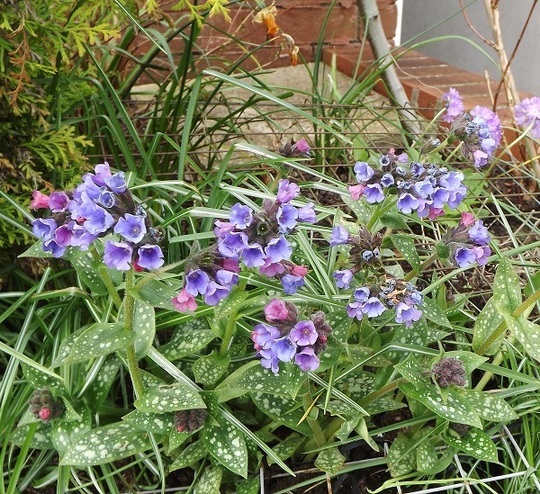 The Pulmonaria is lovely too and though Forsythia may be a plant frowned on by the fashion-gardening crowd, it certainly brightens up the Spring garden. 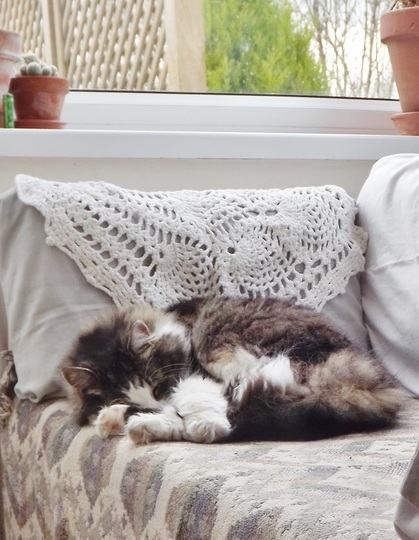 Glad to hear that Beryl is better again and Bella of course will do her own thing and pick the best spots for a bit of garden watching. Lovely and reassuring to see a blog from you on here. 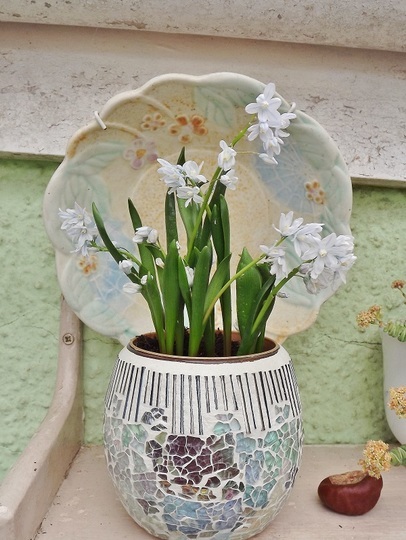 Puschkinia looks very pretty in that delicate pot. If your weather today is anything like it is here, that warm April sunshine will seem to be a distant memory!! Are you also staying indoors?! 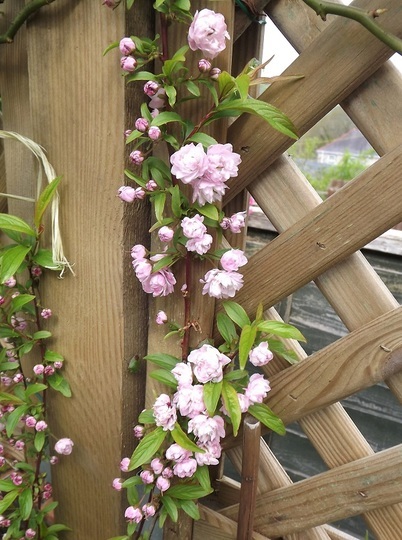 Your garden looks lovely Hywel,and I love your prunus triloba, Just off to google it,see if I can squeeze one in. Everywhere is looking lovely Hywel and you have a lot of Clematis growing. 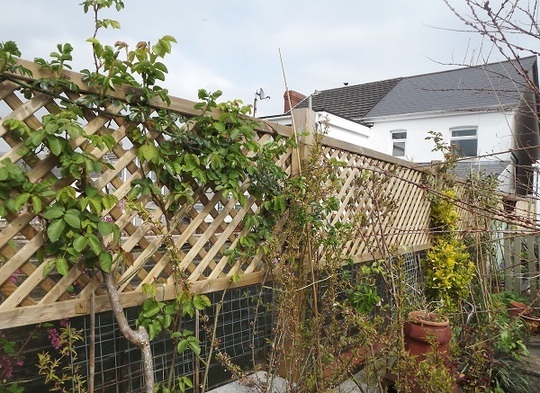 For the first time in a long time, I have pots of Clematis growing on a fence and am pleased that they are doing well. Its been very sunny here but a bitterly cold wind ! At least Bella looks warm and comfy ! You must have some really good earth Hywel, everything does so well for you, it doesn't seem long since you were sorting and planting up against the trellis and just look at them now, we also had those lovely warm day, its back to woolly jumpers now and central heating on early, for all that we really do need some rain, seems ages since it did, I even had the hosepipe out a few days ago, apart from filling up my bins near the g'houses, I don't expect to have to water all the garden in April, the tulips and primroses were going all floppy and wilting and I needed to water my new planted up area. Sorry to hear Beryl has been poorly again, hope she is alright now Hywel, take care both of you x. 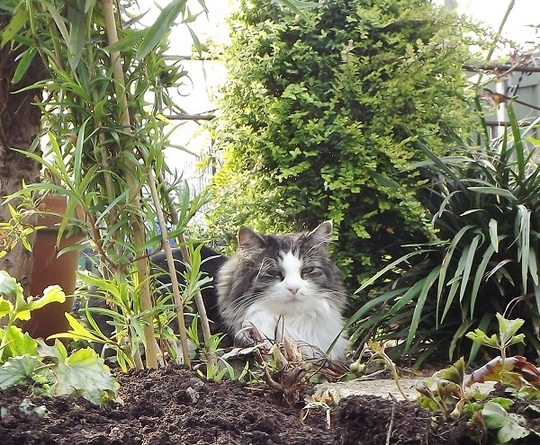 Great blog Hywel garden looking good , Bella looking contented and glad Beryl is ok . I was only thinking about you the other day. So I'm pleased to see you are all o'kay. 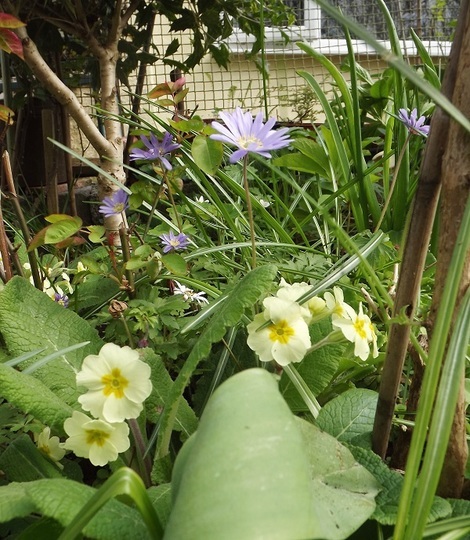 Your garden looks great with a lovely selection of plants. Lots of lovely plants to look at there Hywel. I love Pulmonaria and have masses of it around a pond. I was interested to see that you have just planted a Heuchera which you say has been waiting in a pot for some time. I only have 4 or 5 and I have just left them in pots - should I be planting them out? Always lovely to read your gardening news. Very interesting blog again, Hywel! 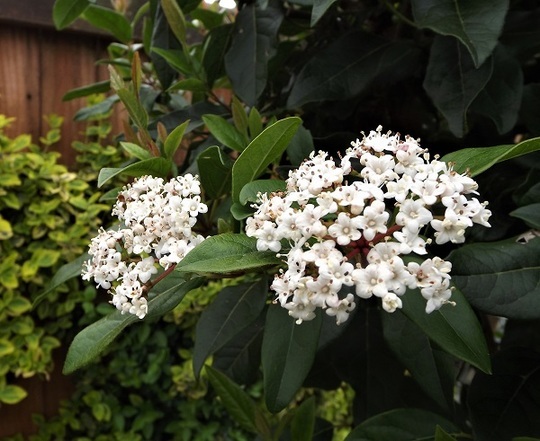 It's always great to see what you have flowering in your garden! The weather has been very cold of late here & we have had several frosty nights during the last couple of weeks. The East/north-east wind has been very strong some days but this weekend it has calmed down though the temps have not increased. Fortunately it seems we are forecast a warm Easter weekend this year! I've had to wrap up many of my plants on the balcony with fleece! I hope I can take it off tomorrow & put it away till the winter! Honeysuckle, I like the Celendines in the garden, they seem to behave here too … well I pull lots of them up actually to stop them becoming a problem. The one in the photo has bronze leaves. Wildrose it has been very cold here today and I have remained indoors. Lori Bella said thanks for the hugs. I hope the weather warms up for you soon. Winter is long enough. Rose some Clematises grow well in pots. I have a few. I hope they do well for you. Beryl is al right now thanks for asking. 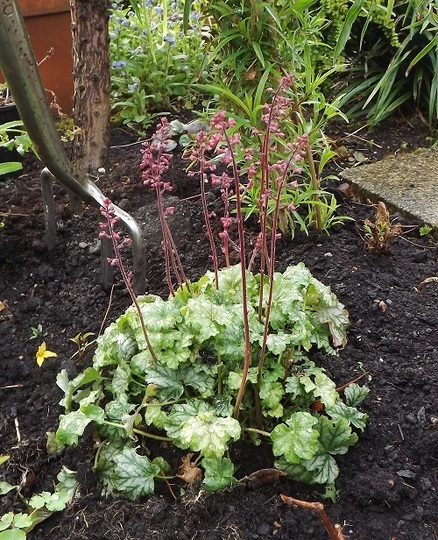 Ginellie, I bought the Heuchera last year but didn't get around to planting it, and it was still in the plastic pot from the garden centre. I don't think they mind being in pots though. Balcony I hope the weather forecasters are right about the weather. It's too cold for April but we haven't had frost here so far. 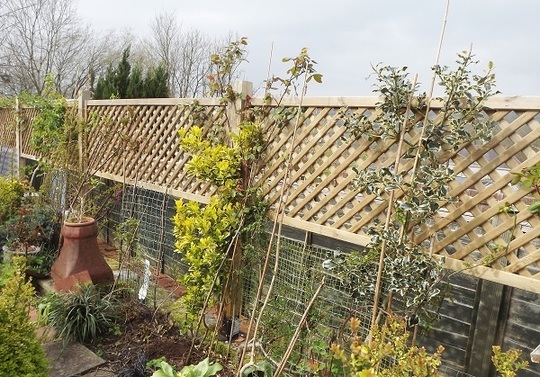 Your garden looks wonderful Hywel your fence is looking lovely with the plants setting it off. 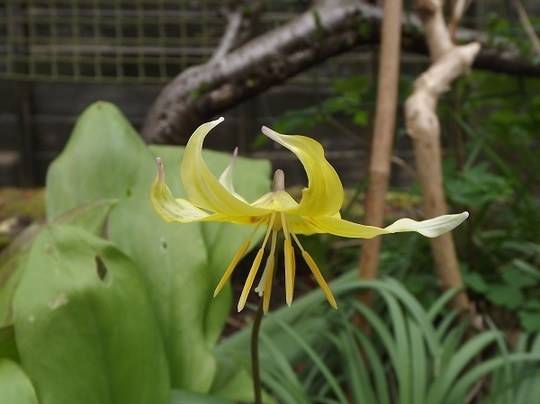 Love that Omphalodes also Erithronium. Really lovely pictures Hywel! Very nice garden you have, lots of very pretty flowers and some wonderful shrubbery. Glad that Beryl is feeling better again , I did wonder why we hadn't heard from you for a while, I thought perhaps you were just taking a break, which is sometimes a good thing. Your garden is looking nice. 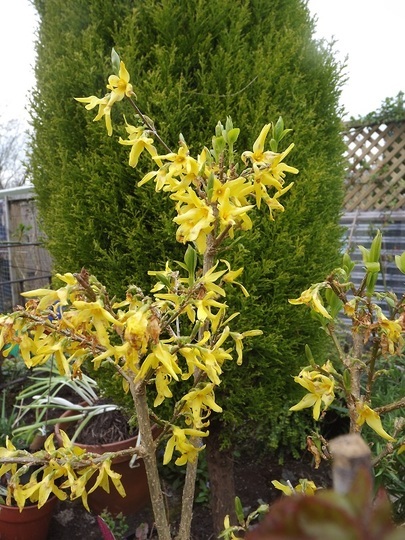 I like things like Forsythia as it makes such a bright splash of colour for such a long time, mine is just beginning to go over now. All the other plants you've shown us are lovely too. Love the bright blue of the Omphaloides. Best wishes to you all, & roll on summer, just dying for everything to really get a move on, impatient, that's me, & tired of cold. Need a nice shower here tho'. the soil is dust on the surface & the birds are having sand baths in it! We had some rain a few days ago Feverfew, the first for a long time which is unusual for these parts. Dottydaisy most of the plants were there before I had the trellises put up but they were supported with bean sticks and bits of wire :) Now they have the trellises and it looks better. Mid February already. How the time flies !